Donating couldn’t be easier, just click this link. Please support the Charitable Trust Fund so we can continue our donations in line with our mission statement at the bottom of this page. You can also see what we have been up to on the ‘News’ page. 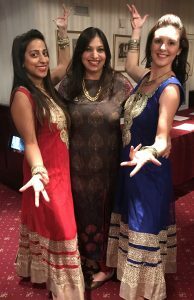 Our Master, Shravan Joshi, and his wife Mira (pictured centre) recently held a Diwali reception at Guildhall during which there was a silent auction of Mira’s photography. Mira is an established photographer capturing scenes ranging from iconic London landmarks to aviation mid flight! The silent auction raised around £1500 for the Fuellers Charitable Trust Fund which was gratefully received and so we wish a happy Diwali to all. 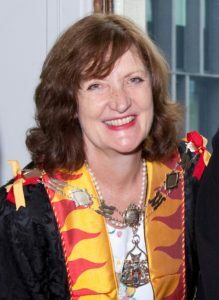 Our esteemed Immediate Past Master Chloe Andrews-Jones recently undertook her own fundraising mission for the Fuellers Charitable Trust Fund. Starting early in the morning at Marylebone Station and ending at Skinners Hall, Chloe laced up her walking shoes and followed a route which took in as many Opercula sights as possible, while adding a personal link. Some were still visible, some had disappeared beneath an emerging City, but all were of interest. We are pleased to announce that Chloe raised over £1500 and it is not too late to make a donation! Please DONATE HERE and use the reference “Masters Walk Oct18”. Thank you. 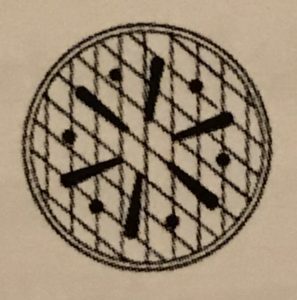 “Opercula – the legendary cast-iron ‘London Coal Plates’, the Victorian coal-hole covers for shooting coal from pavements down into the cellar.” You can also observe Operculars as you turn the pages of our Company publication, The Fuellers Tale. 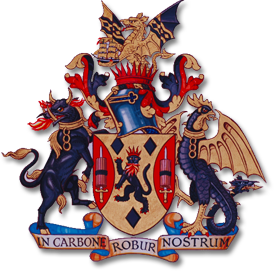 The Fuellers’ Annual Energy Lecture was established in 2005 By Lord Ezra – the former Chairman of the National Coal Board and one of the founding members of the Fuellers; he delivered the first lecture himself and it has been given every year since by a series of prestigious speakers. The event is always well received by an audience from amongst the 110 Livery Companies, the Energy Industry, and Fuellers plus their guests. Lord Ezra also made a gift to the Charitable Trust fund for the express purpose that financial support could be given if needed for the lecture’s continuance and in 2013 he gave a further gift of £20,000. In recent years the lecture has often been sponsored by a professional firm providing services to the energy sector but this year there is no sponsor and the CTF is underwriting up to £4,000 of the cost from the funds given by Lord Ezra. After this, there will be some £10,000 available for support in future years. Please do go to the ‘Energy Lectures’ page to see the full content of this 14th annual lecture given by Christopher Hayward, Chairman of the Planning and Transportation Committee, City of London Corporation. Good news – Fortunately thanks to your continued generosity, our Master was released! We raised £2351 shared between both the British Red Cross and The Fuellers Charitable Trust Fund. Thank you to all who so generously donated. 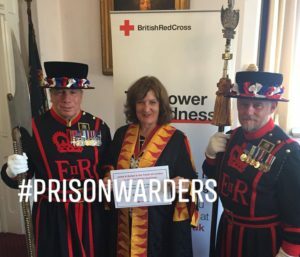 Jail and Bail is an annual fundraising event sponsored by the Lord Mayor. Masters are ‘arrested’ and taken to the Tower of London and not released until sufficient bail has been surrendered. Master Fueller Chloe Andrews-Jones was the guest speaker at Winterbourne Boys Academy, near Croydon, accompanied by Stuart Goldsmith, Fuellers Charitable Trust Chairman. The school is now a member of Platanos Trust alongside Platanos College, which we have supported for some years. 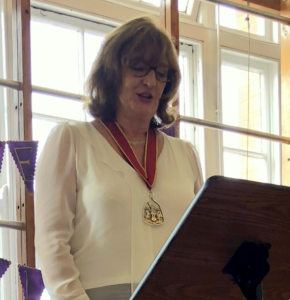 Her passionate speech covered the Livery, the Fuellers and the modern energy industry as well as the boys own journey through education – summing up the values that have helped her succeed – Courage, Honesty, Respect, Teamwork and Communications Skills, not to mention Hard Work! This has been reflected in the Platanos motto which Winterbourne Academy has adopted: ‘Attitude means Altitude’. 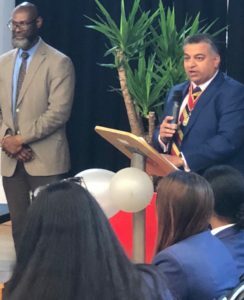 Meanwhile, Senior Warden Shravan Joshi was representing our Master at the Platanos Academy Prize Giving for 12-14 year olds. The event was a celebration of their hard work and achievement while looking to the future and all the possibilities ahead. Shravan delivered a great speech on success, full of fun while acknowledging their hard work and noting the importance of measuring success against hard work, not just results. Before wishing the students every success for the future, Shravan left them with the thought provoking picture of “our extremely complicated and sophisticated industry. from extracting fuels, generating power from multiple sources like nuclear, wind, solar and hydro, converting that raw potential power into something we can use, transporting it to places where it is needed and then making sure it is safe for us to use in our everyday lives.” A little more to think about the next time they turn on a light switch or plug in their phone. Each year The Charitable Trust, in its quest to support research and education, make awards to individuals from our Affiliations. 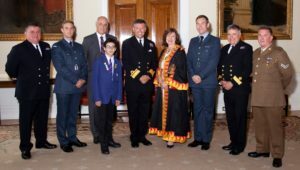 On 9 July 2018, in keeping with this long established tradition, this year’s gathering began with a Thanksgiving service in the heart of the City, at St. Olave’s church, followed by a luncheon and prize-giving in the magnificent setting of Trinity House, one of London’s most elegant banqueting and conference venues. Of all the events held over the year, this one is always especially fulfilling. Mainly because our affiliates and scholars are present, making it possible to celebrate their growth and achievements in such a way that both sides benefit. The service at St Olave’s was conducted by our honorary chaplain Rev Dr. Peter Mullen. This year’s sermon focused on the importance of studying and absorbing the company history and also, of course, on the ‘generosity of the soul’ as symbolised by charity, one of the Company’s most important aims. The principal speaker of the day, Rear Admiral John Kingswell CBE, Deputy Commandant of the Royal College of Defence, adeptly framed a highly contemporary address within the auspicious and traditional setting of Trinity House. Awarded for outstanding performance in preparing warships for critical tasks and an engaging style of management and leadership. Awarded for major contribution in a short time to the training and development of hundreds of engineers while raising funds for the CLIC Sargent charity. Awarded for unique and sustained contribution to the development and delivery of Air to Air Refuelling in the RAF over the last 30 years. Awarded for being one of the most dedicated fuel operators in the British Army, taking great pride in training his men, a true fuel professional and involved across all school activities. Awarded for pivotal contribution to routine activity and deployed operations on land and at sea, notably outstanding support to overseas bases. Awarded for dynamic leadership and substantial contribution to development and utilisation of TSW capabilities. We are delighted to be able to see how our strong links with the Platanos College are making such a difference. 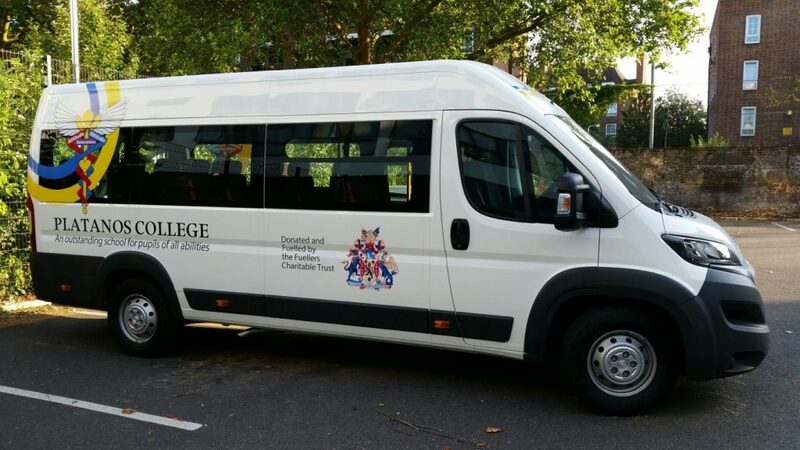 With the help of your continued donations we have been able to purchase a brand new minibus for the College. The Fuellers over a number of years have built up a good working relationship with this inner city London school. The school has shown steady improvements in academic success as well as several extra-curricular programmes, which encourages students to aim for success in their careers once they leave the College. The Fuellers Charitable Trust has been able to give financial support for these extra-curricular programmes which include, Army Cadet Force, St. John’s Ambulance Cadets, Girl Guides and Scouts. These Cadet groups will now be able to be transported to various events in this minibus. With your continued support we are able to go on and assist in the development of the students at this thriving Inner City London School. The Fuellers Charitable Trust has committed to increase its support of these two charities. TeenTech will work with the Fuellers to train and support volunteers who wish to engage with students at one of the schools they help, providing mentoring or giving careers talks. Generating Genius will give similar support to Fuellers providing work experience to 6th formers. Both charities promote the importance of STEM subjects to students from disadvantaged backgrounds and FCT supports them because this gives such students the opportunity to enter the energy industries. This charity was established in the late 1990’s in a community in the London area suffering a considerable amount of illiteracy and crime. It was set up in the late 1990’s and is a community-led educational charity offering, both adult and child fast track literacy and English language classes. Funds raised allow Real Action to engage and train volunteers and teachers to run classes during school holidays and Saturdays during term time to improve reading literacy. These classes are known as ‘Butterfly Reading Courses’. 30 hours of Butterfly teaching produces an average improvement of 12-14 months in reading age. Today these classes are expanding around London and around the Country. The Fuellers are proud to be supporting such a worthwhile cause. This organisation awards scholarships to ‘A’ level students studying engineering and related areas of design. It encourages the student to pursue these subjects at University or through high quality apprenticeships leading on to possible future careers in this field. The Fuellers Charitable Trust sponsors a student over a period of two years. The Fuellers’ are pleased to continue an annual contribution to TS Rebel. This is a coastal training station based on the Essex coast. The training staff comprises of 24 RYA qualified volunteer adult instructors who are with the Sea Cadet Corps. TS Rebel provides offshore, power boat, keel boat and yacht race training for young people. It is a recognised Training Centre for the Royal Yachting Association and an Independent Operating Authority for The Duke of Edinburgh’s award. 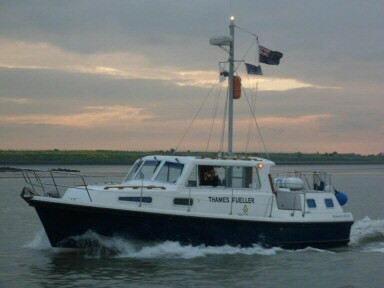 The Thames Fueller is a Mitchell 31 MkIII powerboat. It is used for powerboat training and as a keelboat support vessel. 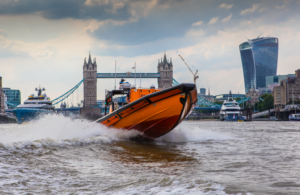 The Charitable Trust continues to contribute to fuel costs for the Tower Lifeboat Station in the City of London which is the busiest Lifeboat Station in the UK. It is on call 24 hours a day and is the dedicated Search and Rescue resource for Central London which covers approximately a 15 mile stretch of river from Barking Creek to Battersea. In addition to Search and Rescue they take a proactive role in marine safety and accident prevention. They will always be seen patrolling the Thames particularly at festivals throughout the year such as New Year’s Eve and the annual Boat Race. The Fuellers Charitable Trust Fund is for the relief of poverty, education, research, and assistance to those causes primarily having a direct connection with the objectives of the Fuellers Company. This is as directed in the Trust Deed and in accordance with its Policy of Giving. The Trustees of The Fuellers Charitable Trust Fund and the Clerk of the Company shall be guided by this Policy of Giving providing such guidelines remain within the scope of the Trust Deed. The aim of the Trustees is to donate in any financial year at least two third’s of the previous year’s Net Incoming Resources. Should the value of the Fund fall below a prescribed value, then the Trustees shall decide at the start of the financial year the amount of Fund they would be able to donate. Where possible, positive responses shall be made to those charitable requests where the donation may make a significant impact. Preference shall be given to small and medium size charitable organisations. Where possible, special consideration shall be given to appeals where the name of the Company can be clearly linked with the donation. Relief of poverty and hardship especially relating to Members of the Company and then to members of the energy industries. Advancement of education by the grant of scholarships, prizes and sponsor research, especially within the energy industries. There shall be a list of standing donations, which shall be reviewed by the Trustees annually.